As you may already know; rainwater is repelled by lotus plants. Why? 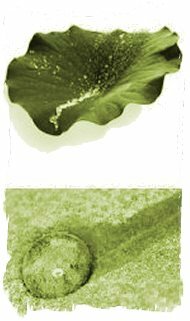 Because these plants have a natural cleaning mechanism and raindrops have almost no contact with the surface. 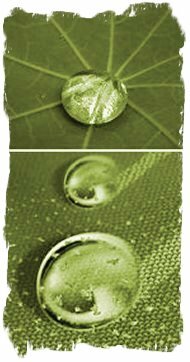 Water droplets roll off the leaf and take dirt, insects, contaminants, water based adhesives, honey, oil and other substances with them. This phenomenon has been researched by scientist and can now be reproduced for use as nano coatings. Time and money can be saved, and cleaning agents become almost redundant. Our products are therefore recommended for all businesses with hygienic regulations, for example, food selling businesses, restaurants, cafes, butchers, abattoirs etc. Our products are, of course, also recommended for private use to protect all sorts of things against contaminants or weathering and to save time and money on the use of cleaning agents. A Fully tested highly effective product, providing long lasting protection. Treated materials are not visually changed and remain suitable for whatever their original designated use. Protection against aggressive environmental impacts, weathering and scratches. Surfaces and all sorts of textiles are easier to care for. Longer lasting cleanliness; visually and hygienically, antibacterial, easy cleaning, neutral to skin, non-allergenic etc. All that and easy handling make nano coatings ideal for all different areas. If the repelling effect decreases, it's probably something to do with soiling. In that case, clean the surface or textile with a mild cleaner and wash off thoroughly. Afterwards the repelling effect will be reinstated (with textiles after drying). If the coating is actually damaged, the surfaces can easily be retreated. There are even more advantages with nano coatings and when used once you will never want to be without it !